In his new book, Making Sustainability Stick, Kevin Wilhelm offers a wealth of insight; experience and tools to help individuals and organizations deliver more business value by adding environmental and social parameters to their business strategy. By taking a look from the inside at the work of pioneering companies like Starbucks and REI the book shares some of the key things that have contributed to progress and tries to help folks avoid some of the setbacks of those who have gone before. I was honored when Kevin invited me to co-author the chapter on organizational change. It turned out that we had both been thinking a lot about the different phases or chapters that organizations seem to go through. The result of our collaboration was a new “phases of change” diagram that provides a road map for progress. 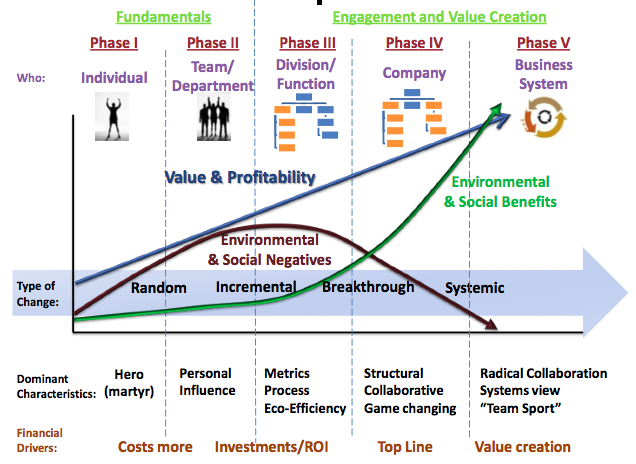 It can help change agents capture more value at each stage and hopefully will accelerate progress. In this series of posts, I will offer additional background, insights and explanations of the diagram and share some stories from the journey that I hope will help readers see what this looks like in real life. There is a well-established school of thought about the stages that companies pass through on the way to adopting sustainable business thinking. Writers such as Peter Senge, Brian and Mary Nattrass, Bob Willard and the team at EKOS (among others), have all written about 5 stages and have described them in their writings. Our model builds on their observations and research but looks at the stages a little differently. We use our experience inside organizations that are changing to share key learning about what makes each stage valuable, different and most of all – what stops companies from making the leap to the next stage. From today’s conventional business on the left side of the diagram, to the future of business on the right, we show the phases of change along the path. Horizontal bands describe key areas that change along the way, highlighting indicators to look for and the issues that need work to make progress. In addition, we get a view of the kinds of benefits; environment, social and financial that result in each phase of progress. One thing that this diagram helps us understand is why we have so much trouble with language in the sustainability space. Folks use the same words to mean different things and there is very little alignment around definitions. One explination is that when we are in the process, seeing the world from the phase we’re in, it may be hard to see the next stage, let alone several stages ahead. We are likely to define terms based on what we are experiencing at our stage of the process. For example someone at stage 1 understands sustainability to mean random acts of greenness that are well intentioned but costly. Someone at stage 2 thinks it means eco-efficiency, the happy coincidence of lower impact and lower cost, such as energy efficiency. Today very few companies and business leaders are thinking in terms of stage 4 or 5 definitions and therefore the language can be confusing. The blue growth curve represents a core idea of this chart. It suggests that sustainable business thinking will make companies more successful. Therefore it sees no compromise between growth/profitability/ success and environmental and social responsibility. In fact, companies that use these new skills and competencies to implement sustainable business strategy will be more profitable and will outcompete their peers - they are more likely to grow. They will do this because they will create more financial, environmental and social value and customers and other stakeholders will reward them for doing it while they punish others. From a conventional thinking point of view this sounds pretty radical. Stage 1 Conventional thinking tells us that growth and sustainability are opposites and that corporate social responsibility is about finding the right balance. I've written before about rejecting trade-offs. As former REI CEO Sally Jewell used to say it; “what if the bigger we got the more good we could do and the more good we do, the bigger we get?” What if sustainability creates a virtuous cycle that delivers more of both? This idea of more good vs. less bad is described in the Brown and Green lines. Many companies are starting to identify and measure the unseen environmental and social impacts of their business. The brown line describes the increase of negative impacts for conventional stage 1 business. As the organization adopts ways to mitigate negative impacts the trajectory of the curve begins to change. Along the way companies begin to identify ways in which they can redesign their work and shift the emphasis from reducing negatives to enhancing positive side effects. These positive benefits are represented in the green line and it shows that by stage 5 companies operate in what John Ehrenfeld would call an industrial ecology or eco-system where they benefit those around them. There is no waste, just value creation in other forms. As companies move to the right along the curve each phase of the process engages more of the organization, involves deeper changes and more and more benefits are unlocked. This is not to say that there are no setbacks, do-overs and trials along the way, there are. In this series of posts, I’ll dive deeper into each chapter and offer some stories of real life trials, tribulations and success that I hope will provide both practical tips and sufficient inspiration to help others make progress.